Boatersland Marine > Engine/Mechanical > Fuel System > Fuel Fittings and Barbs > Attwood 88837 Johnson/Evinrude/OMC Fuel Tank Fitting 1/4"
Attwood 88837 Johnson/Evinrude/OMC Fuel Tank Fitting 1/4"
Install in fuel tanks with standard 1/4" male NPT thread. Solid machined brass. 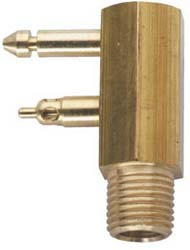 For use with Attwood 8889 or similar quick-connect hose fitting.